Imagine venturing out in 100-plus degree weather. You have to because you are hungry, but yet, you love that constant flow of air conditioning. What might seem lazy to some, in Bossier City, drive thrus are just plain convenient to hungry locals. In Louisiana (home of drive thru daiquiris), residents can get just about anything by simply driving up and not just the signature daiquiri. 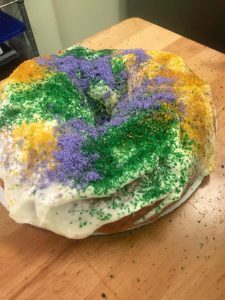 Though king cake orders happen year round at the restaurant, you must order at least 24 hours in advance outside of Mardi Gras season – and it will be worth it! After you order in advance, swing by the drive thru and pick up the king cake. At lunch, this spot is busy – especially the drive thru. Lots of local police officers, firefighters and Airmen and women stop in during mealtime. The eatery does offer a five percent discount to first responders and military. Don’t let the packed lot discourage you. If you order to go, your wait is only about five to seven minutes because Fat Tuesdays likes to keep their drive thru moving. “We wanted to have a drive thru because it is a small building and it is convenient for customers to just pull up,” she said. But if you have the chance, step inside and enjoy the Cajun music and great customer service. Also try: The Red River Bayou Tea. This special creation is a mix of sweet or unsweet tea and hurricane punch. If you are a new in Louisiana and you lived here long enough, on any given day, you will start to crave gumbo. Don’t worry, it’s natural. 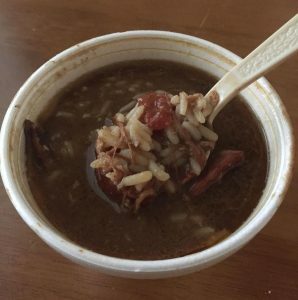 Whether summer or fall, this hot soup is available year round and as an added bonus, you can drive right up and get your gumbo to go at the local eatery Gumbo to Geaux. A spicy mix with a heaping amount of chicken and sausage drowning in a dark roux will satisfy those Louisiana cravings. Order from a cup to a gallon, during tailgate season, swing by the drive thru instead of making the roux yourself. Also, Gumbo to Geaux offers seafood gumbo in the same sizes. Just like at home, the gumbo at this restaurant is cooked in a large pot rather than inside a kettle like at most Cajun restaurants. Aycock does recommend the gumbo and he added that getting the gumbo at the drive thru does not require an order. Lunch is their busy time for the drive thru but the food it worth the wait. Who knew at a place called Taste China you could also get a taste of Bossier City? 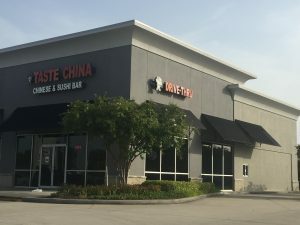 Seeded in the heart of South Bossier, this restaurant is one of the best places to experience Chinese and Japanese dishes. All of the positive online reviews are all the proof you need to take your taste buds to this quick drive thru. From the taste of it, the Bossier Roll makes the city look fresh and delicious. Inside the roll is shrimp tempura with spicy tuna and avocado wrapped in a soybean sheet topped with pepper tuna and avocado. This roll is eight bites of Bossier bliss that makes you feel like this restaurant has perfectly captured a taste of Bossier. But it isn’t just about the special rolls. At Taste China, time is of the essence. The owners and the staff are dedicated to providing the best experience. As mentioned on their website, you can pick up your to go order 15-20 minutes after it is ordered – and sometimes faster. Ordering online is easy at www.tastechinala.com/, plus the site is optimize for mobile devices if you are driving an a craving hits. Once your order is placed, you get an email confirmation and you better get off the couch because hot and delicious food will be waiting for you at the drive thru. Also try: Fried Rice. So fresh and so good, you could consider an order of this as a main course.